If you can't see the image, here's a larger version: Also, some more details from PrivacySOS. 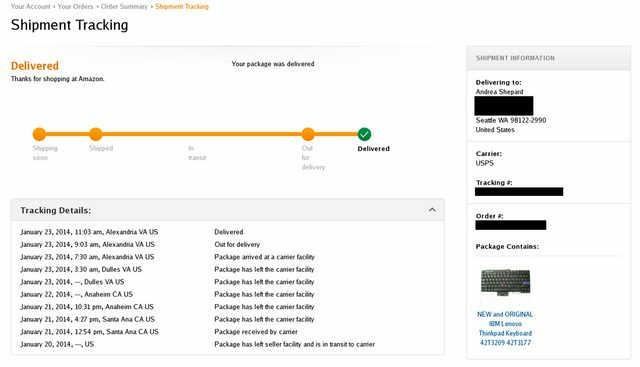 As you can see, rather than go from the Amazon warehouse in Santa Ana, California up the coast to Seattle, instead the package went across the country to Dulles, Virginia to Alexandria (right outside of DC) and was "delivered" there. Upon seeing this, my initial reaction was that it might not be a big deal. With shipping logistics these days, it's not uncommon to see a sort of hub system, where packages travel across the country from one warehouse to a shipping hub, only to be shipped back across the country for actual delivery. But that does not appear to be what happened here at all. As Kade from PrivacySOS pointed out, the final Alexandria address is the final delivery location, rather than the sign of something in process. Also, the fact that it bounced around and then went "out for delivery" to that address shows that it wasn't just popping in and out of a hub for delivery to Seattle. There are some possible other explanations, including just a general screw-up on the part of Amazon. But given the revelations of how the NSA's TAO group does very targeted spying, that often involves getting access to computers being shipped to targets, combined with the fact that the NSA has made it clear that breaking Tor is a priority that has mostly stymied them, this certainly should raise multiple eyebrows. Elizabeth Warren Wants To Break Up Amazon, Google And Facebook; But Does Her Plan Make Any Sense? UPS and FEDEX have partnered up with USPS under a program called "SmartPost" where the package is handed off to the USPS for final delivery. The premise here is that it saves customers and the aforementioned carriers a few cents. The reality is it briefly puts a package in the hands of the feds that otherwise would be much harder to inspect and/or compromise in the hands of a 3rd party private courier.